Mon 11 March 2013 - In a sense, it was the heart of a larger- than- life local that stopped beating, the life of a charismatic and hyperactive Dominican that was sucked from it by a mystifying and incurable disease. In a sense, it was a theatrical man of the soil who died last Tuesday. 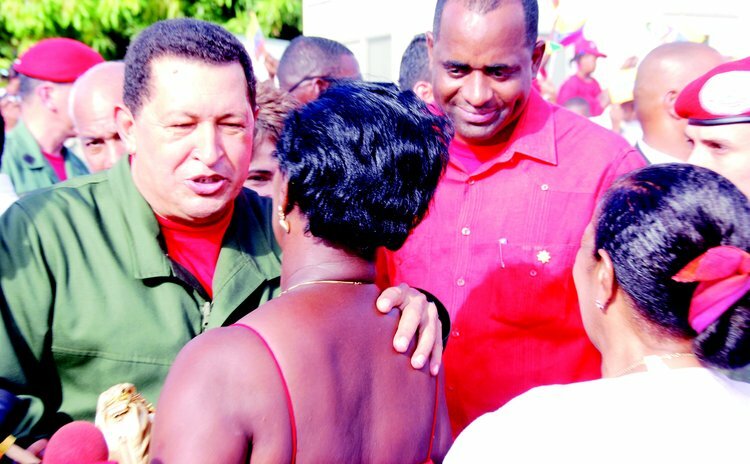 "…he was Dominican in many respects," a grief stricken, emotional and teary Roosevelt Skerrit cried, moments after it was announced that Hugo Chavez, the flamboyant Venezuelan leader, irritatingly bumptious to many in the developed world, but equally idolized by the poor in his homeland, had died. And, in a sense, his homeland extended way beyond the boundaries of the South American mainland, his giving, paternal hands, unfolding and unfurling as it touched the seat of power here. "I have lost a colleague, a father, a brother and a friend," Skerrit continued, a hollow and heartbreaking sadness in his voice. "Hugo Chavez held my hand in the brightest and darkest hours of my tenure to date as your Prime Minister." He didn't say what the darkest hours were when Chavez held his hand. However, for the Dominican leader, Chavez's passing must qualify as one of his darkest. But the darkest hour is followed by the dawn, and, as the post-Chavez era dawns, so does the uncertainty for many so-called "Chavistas" across Venezuela and those here to whom he extended his hands like "a father". After Chavez returned to Cuba last December for cancer surgery for the fourth time, Skerrit prayed for the Venezuelan leader's recovery, telling Dominicans, "We are in the battle together… There is no doubt he will overcome this." Now, with the prayers left unanswered and the battle lost, the tide of mourning and sorrowful cries that echo through the streets of Caracas and the mountains of Dominica, cannot mask the fears for the future promised by this benevolent Bolivarian "father, brother and friend". The Dominican leader touched briefly on the PetroCabibe and ALBA initiatives, and Jamaica said it was hoping that Chavez's successor would continue the programme. But it was Ralph Gonsalves, the Vincentian prime minister, who said it most profoundly. "Without Hugo Chavez, there would have been no PetroCaribe, no ALBA and no Community of States of Latin America and the Caribbean," Gonsalves said. "My country and others in the region have been huge beneficiaries from all of these initiatives of Chavez and more." No member of the Dominican public is certain how much Chavez's benevolent hands rained on Dominica. The fear is, as Jamaica hinted, that the generosity will end, or, at the very least, ebb, with his passing. The hope, on the other hand, is that it will be business as usual. "The relationship between the prime minister and President Chavez is a close, personal relationship, but it's also a relationship between countries," one senior cabinet minister told The Sun just two days before Chavez's death. "If, God forbid, anything happens to President Chavez the relationship will continue." The minister spoke to The Sun on condition of anonymity because he did not wish to speak publicly about the issue while the Venezuelan leader was fighting for his life, and he also felt that any such statement should come from the ministry of foreign affairs. However, he gave a brief glimpse into the tangible benefits that the country derived from this relationship. He mentioned a number of water projects in places like Campbell, Delices and Warner, the hospital and housing projects, the removal of old boats from Portsmouth and wastes from Gimmit as projects funded with monies from PetroCaribe. He also talked about the oil facility at Belfast and the 30 Dominicans it employs. "If we are to quantify it, it runs into millions and millions of dollars. We are very proud and we are very thankful to have a friend like President Chavez. Had it not been for (Chavez) and China the economy would be stagnant. Thank God for President Chavez," the minister said. Similar sentiments were expressed in Caracas as Chavez supporters and beneficiaries poured onto the sweltering streets with broken hearts and desolate souls, in mournful memory of the departed leader. However, what was seen as benevolence by the authorities here has been described as tying the country's future to "the waistcoats" of others by the former government minister, Athie Martin. "The mistake we are making is we are pinning our future to the waistcoats of other people. It's not about whether Chavez dies or not. It's about us. Something else has died inside of us. No one talks of the regional agenda anymore," Martin told The Sun a few hours before news broke of the Venezuelan leader's death. "Even the PetroCaribe thing, it says more about us than about him. We have become poor excuses for nations. Chavez has his agenda, what is our agenda?" The question, asked before Dominica and the world knew of Chavez's death, was left unanswered, very much like the questions surrounding the future of the income stream from Venezuela. In Caracas, the processions by the Chavistas went past crumbling tenements that decorate the capital. Here, the authorities will hope that this was not symbolic, because, as Skerrit cried, "We have suffered a great loss." And, he made it seem that somehow, a part of Dominica has died.